It appears that every flight on this trip, save the intercontinental legs, are one hour long. And so it proved when exiting Vietnam. But flying in to Luang Prabang on a prop aircraft, I was immediately struck by the verdant hillsides that cover the landscape like a ruffled duvet. The international airport is of a similar size to that of a European provincial city. Transfer to the hotel is by six seater tuktuks. Unlike it’s neighbours of China, Vietnam, Cambodia and Thailand; Laos is a comparatively little known and even less visited country. The country’s fifth neighbour, Myanmar, is now opening up and promoting itself as a travel destination. Laos is landlocked and therefore does not attract the tourist group that comprises beach seekers. It’s major cities have not got the same draw as Bangkok or Beijing. But what a surprise. A country that was part of Siam, invaded by China, colonised by France, bombed by America, influenced by its immediate neighbours, and encountered much internal conflict; it has so much to offer. 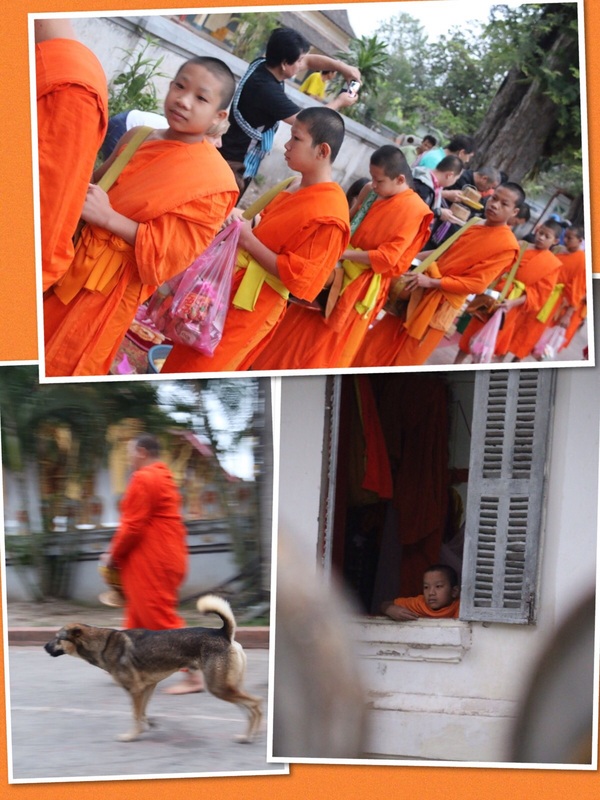 Luang Prabang is a hiker or backpackers heaven. The main street has a line of outdoor adventure tour shops, bars and guesthouses. But it has local charm. It is, like almost everywhere else on this journey, a UNESCO listed World Heritage Site. Although appearing as a ‘tourist attraction’, the daily early-morning Takbat, a possession of Buddhist monks receiving alms from the people has a charm. The main street is full of visitors presenting rice cakes and rice to the monks; but it is the side roads where knurled old ladies present with a variety of foodstuffs. 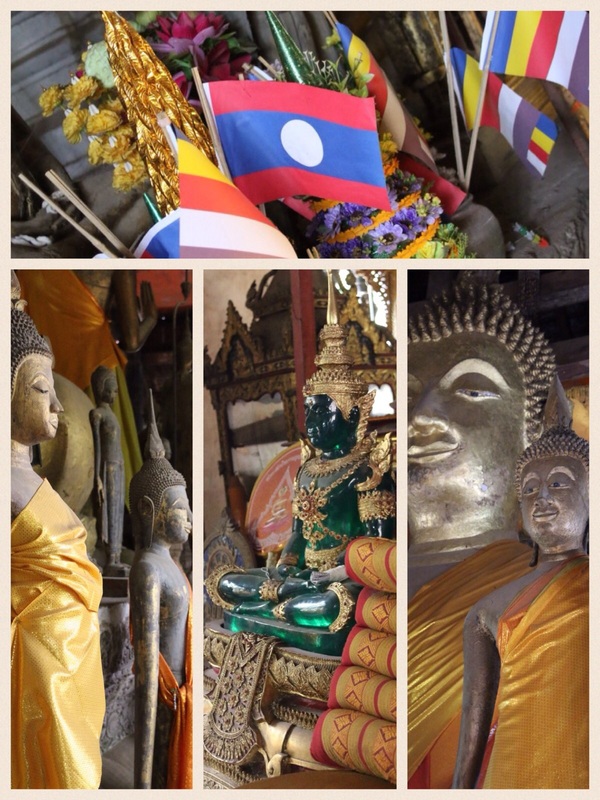 Of course Luang Prabang has its quota of temples, one such being the holiest, Wat Visoun. Sacked in 1887 by the Black Flags invaders from southern China, it was rebuilt and now houses one on the few emerald Buddhas. The Royal Palace, now the National Museum still retains furnishings, decorations and cars from the monarchy that was formerly dissolved in 1973 following the last anointed king’s death in 1965. 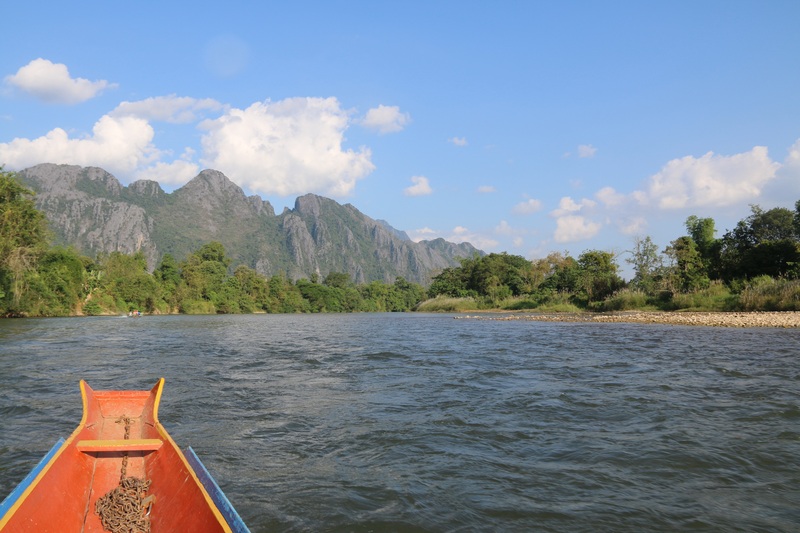 A boat trip on the upper reaches of the Laos section of the Mekong River offered seclusion but was also mildly disappointing. The landscape is stunning but due to the mining and other heavy industry that takes place upstream in China; the river is heavily silted. There is also a total absence of wildlife in any form. It does however offer caves that have been converted into Buddhist shrines. 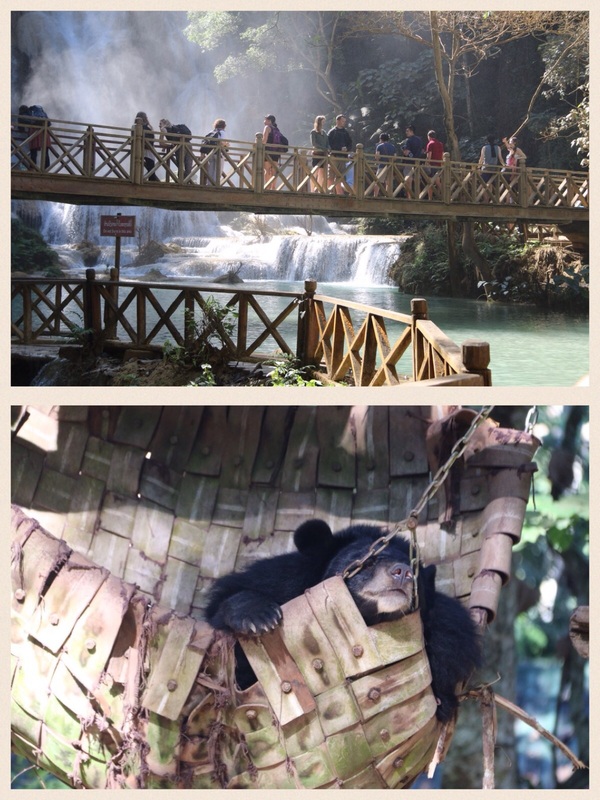 Not far outside Luang Prabang, I was rewarded with lunch at the beautiful Kuangsi Falls in the Waterfall National Park. The park is also home to the Black Bear Rescue Centre where, as the title implies, bears are given a calm shelter from the cruelty inflicted by man. It’s a wonderful setting where you can swim in mineral infused water or just soak up the scenery. 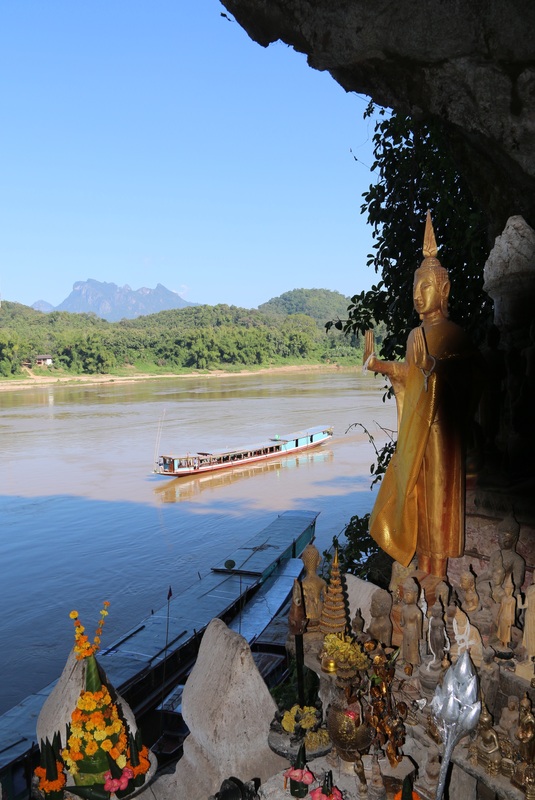 From Luang Prabang to Vang Vieng is an eight hour drive along the torturously winding Highway 13 that weaves its way along the Karst mountains. Landslides are frequent and the tight hairpins with vast abysses below are not for the faint hearted. But the scenery is amazing. 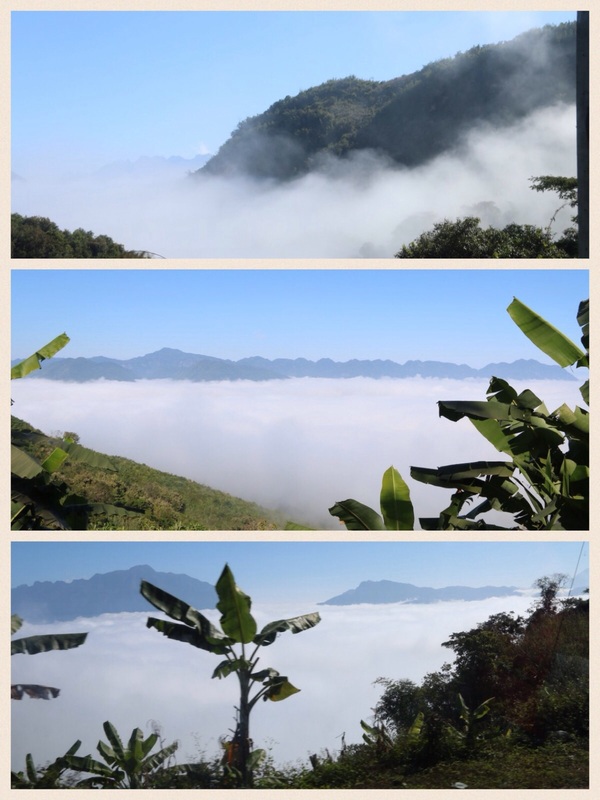 The early morning provides views of mountain tops sitting on thick fluffy fog that pervade the valleys below. By mid morning the fog has lifted revealing lush green foliage. Coupled with clear blue skies the scenery distracts from the roadside hazards…almost! Vang Vieng? I’d never heard of it! Sitting astride the much cleaner Nam Xong River, it is a place designed only for relaxation with a few adrenalin junky trips thrown in. An early morning commute by powered canoes rewards the passenger with stunning views of the riverbanks and mountains beyond. Apart from the roar of the engine, there is little else to interrupt you from the beauty around. Walking, biking, visiting caves, canoeing, tubing, hot air ballooning; it’s all here. It is a young persons’ party town with strict controls on nighttime noise; but if you’re in Laos you are young of heart anyway…or so I tell myself! R&R done with; the onward journey takes us to the capital of Laos, Vientiane; the name meaning ‘Sandlewood City’. It is a city with almost the hussle and bustle of Hanoi or Siagon but without the kamikaze squadrons of motorcyclists! It’s relative humidity is also beyond a scale that I have encountered since Saigon. Much of old Vientiane has been destroyed over the decades. The thrice built Royal Pavillion is one building that has been reincarnated to support just one item, an emerald Buddha. Unfortunately the effigy is in Thailand, and has so far not be repatriated to it’s rightful home. 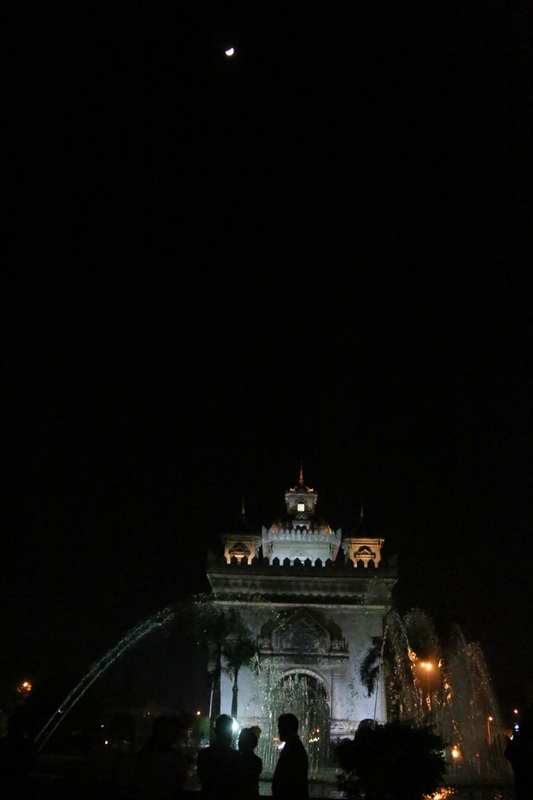 The Patuxay or Victory Monument (or Arch de Triumph) was built in 1962, a belated celebration commerorating indepence from France. It’s own epitaph refers to it as “From a closer distance, it appears even less attractive, like a monster of concrete”. Despite this apparent slur, Laos is quite simply one of the most beautiful countries I have ever visited. Anonymous Laos…hopefully not for too long but don’t tell everyone.